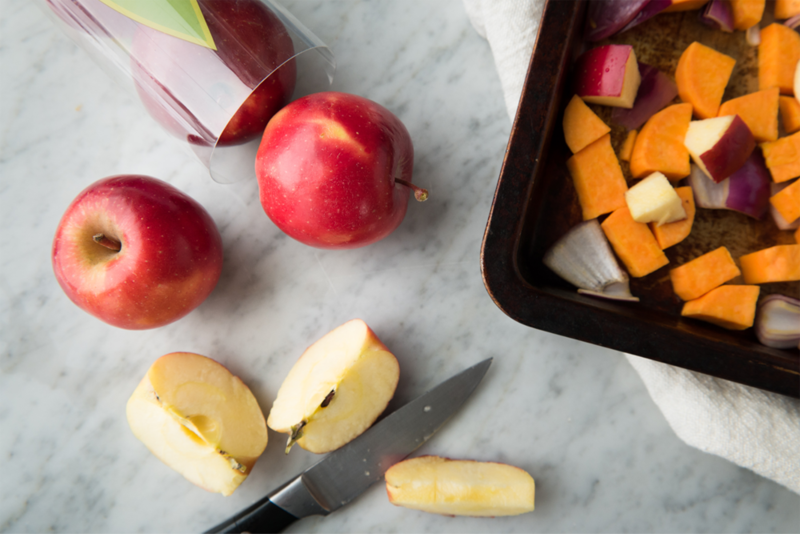 Firm and sugary Rockit® apples are perfect for roasting. 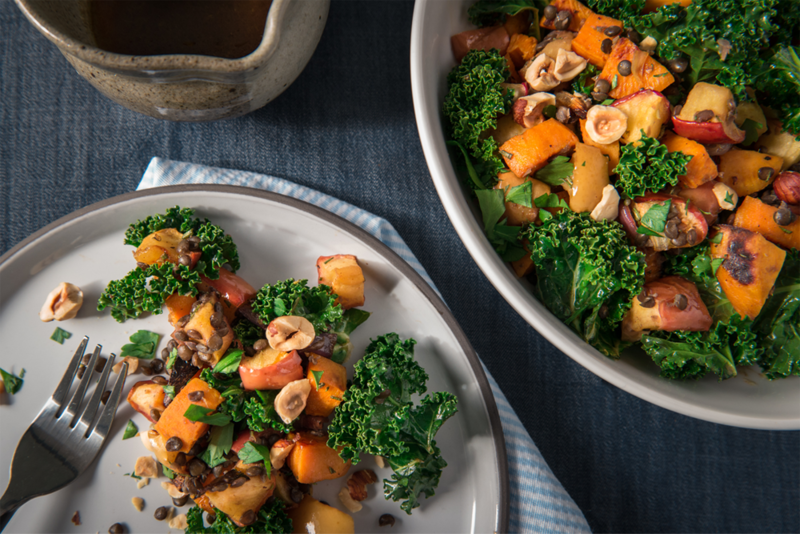 They add a wonderful sweetness to our warm roasted winter salad with sweet potatoes, kale and black lentils. This healthy protein-strong salad makes a hearty main for two or a colorful starter for four. Put lentils in a small pan and cover with three inches of water. Bring to a boil and cook until soft but not mushy, about 15-20 minutes. While the lentils are cooking, toss the Rockit® apples, sweet potato and red onion in olive oil. Spread onto baking sheet and sprinkle with salt, fresh ground pepper and rosemary. Bake in oven for 25-30 minutes, until fruit and vegetables are cooked through but still firm. While the fruit and vegetables are roasting, make the vinaigrette. Place the olive oil and pomegranate molasses in a small bowl and whisk until completely combined. Add the rest of the vinaigrette ingredients and whisk until emulsified. Rinse and drain the cooked lentils thoroughly, then place in a large bowl. Add the kale and half of the vinaigrette and mix carefully. Set aside. Once the fruit and vegetables are done, add them to the lentil and kale mix. Add toasted hazelnuts and parsley and mix. Add vinaigrette one tablespoon at a time, stirring well after each addition. Stop, when all salad ingredients are well coasted but not soaked. You may have some vinaigrette left over.